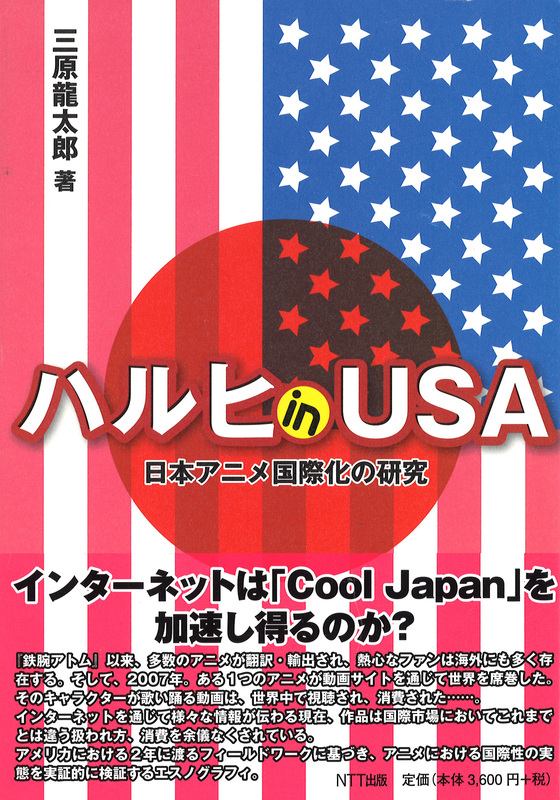 Cover des Buches von Mihara Ryôtarô zu “Haruhi in USA: Nihon Anime Kokusaika no Kenkyū (Haruhi in USA: a Case Study of a Japanese Anime in the United States)”, 2010, Tokyo: NTT Shuppan. It has been more than a decade since the global appeal and presence of Japanese popular culture (hereinafter called “J-pop”) was identified and labeled as “Cool Japan.” Since then, Japanese government has committed itself to the overseas promotion of J-pop, and the resulting policy set has been called “Cool Japan” policy. As an academic field of research, this topic is located at the theoretical intersection between popular culture, power, and industrial policy, since government, one source of a certain kind of “power,” is a virtual key player in J-pop’s global spread. However, few previous studies related to this topic focus closely on the government’s efforts to promote J-pop and its cooperation with individuals (and institutions) from the J-pop sector. Although much “Cool Japan” policy is planned and implemented jointly by individuals both in government and in the J-pop sector on the basis of their close communications and relationships, many studies abstractly and classically assume government to be J-pop’s monolithic outsider that intends to impose authoritarian, “from above” power to the J-pop field. Aim of the talk is to fill in this gap and present an insider’s view on the “Cool Japan”-policy formation. How can we develop an understanding of the government’s role in the global spread of J-pop? What can this topic tell us about theories of pop culture, power, and industrial policy? By investigating relevant analytical theories and the Japanese government’s “Cool Japan” policy, the presenter will discuss about possible answers to this set of questions. Ryotaro MIHARA is Senior Visiting Researcher of Keio Research Institute at SFC and Lecturer of School of Global Japanese Studies at Meiji University. He worked for Japanese Ministry of Economy, Trade and Industry from 2003 to 2012, and was in charge of “Cool Japan” policy from 2011 to 2012. He is the author of Haruhi in USA: A case Study of a Japanese Anime in the United States published by NTT Publishing. Japanologie Frankfurt, in Kooperation mit den Interdisziplinären Zentrum für Ostasienstudien (IZO), Goethe-Universität.